Brisbane City Council rejected this development but the Court approved it. Sediment Control has been a farce through the development. 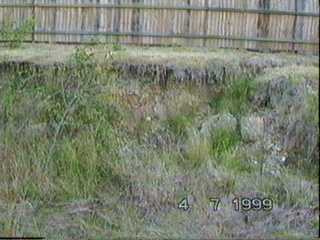 The Developer was allowed to narrow the creek by pushing fill over the creek bank. Now a section of the creek bank is unstable and falling into the creek. No visible action has been taken to develop the park component of the development approved by the Court Decision even though it is now almost two and a half years since the development started. Picture taken from Todman Street Carina. It's a shame that the BCC allowed this to happen.